This week I managed to purchase a wonderful image of the 1st / 2nd East Lancashire Field Ambulance which was taken at Giza, Egypt in October 1914. Assistance to identify the unit shown in the image was generously given by Andrew Mackay, co-Author of Burnley & the Royal Edward Disaster – ‘The Story of Callam’s Own’. The 1/1st, 2/1st and 3/1st East Lancashire Field Ambulances which in total consisted of 30 officers and 665 men left with the 42nd Division in September 1914 for Egypt and the defence of the Suez Canal. Disembarkation began at Alexandria on 25 September, and with the exception of the Manchester Brigade concentrated around Cairo, where acclimatisation and further training commenced. The 1st / 2nd East Lancashire Field Ambulance was the first of three Field Ambulance units belonging to the 42nd Division to be mobilised for action abroad. The East Lancashire Field Ambulance units were staffed by some of the most highly qualified medical men from Manchester and the District. When the call for Imperial service came they, and their men, responded swiftly and were to endure great hardships during the course of their Gallipoli service. Its a superb image and one Ill be taking with me to the Cardiff ‘Views of an Antique Land’ conference for scanning on the 20th May. For further details on the Cardiff project and upcoming conference please see the links listed below. I was so pleased to be invited to speak at the closing ‘Views of an Antique Land’ project conference which is being held on the 20th May at Cardiff University. My paper ‘Recollections and Representations of Cairo (1914/18) – The Egyptian Expeditionary Force’ will include a brief overview of the strategic importance of Egypt and the logistical challenge of housing, feeding and caring for the large numbers of Commonwealth troops involved throughout Egypt. I’ll be talking about leisure and recreation in Great War Cairo, Luxor and Alexandria and how this ‘friendly invasion’ affected life in Cairo for the Egyptian people. I find this ‘social history of soldiering’ enormously entertaining, their reminiscences are at times ribald but they display an intense fascination with the culture and history of Egypt. On the 10th of January 1915 Officers and men of the 11th Battalion, Australian Imperial Forces posed on the Great Pyramid of Giza for what would become an iconic photograph. The 11th Battalion did much of their war training in Egypt and would be amongst the first to land at Anzac Cove on April 25, 1915. In the five days following the landing, the battalion suffered 378 casualties, over one third of its strength in totality. Following the withdrawal from Gallipoli, the battalion returned to Egypt where it was split to help form the 51st Battalion and redeployed to the Western Front until 1918. Most of the 703 men who posed for this iconic image have never been identified and it is likely that this is the last photograph of many of them, Captain Barnes included. He was killed in the Dardanelles on 28th April, 1915 and is commemorated on Panel No 33 of the memorial at Lone Pine. Various urban myths surround the photo which have been perpetuated over time – the popular ‘dead man’ myth being one notable example. It’s worth taking a moment to review the excellent work on debunking the myths completed to date by the WAGS Project. Work on the image is still ongoing in an effort to try and identify as many of the men as possible. Please see http://11btn.wags.org.au/ for further details. To coincide with the inauguration of the new Suez Canal the Ministry of Antiquities have recently organised several events to mark the occasion. News of interest is the commissioning of a new Museum in the Kantara area which will focus upon Egypt’s military history from the Pharaonic to more contemporary periods. In a recent interview with Ahram Weekly Mohamed Abdel-Maqsoud, the coordinator of archaeological sites around the Suez Canal, confirmed that after the official opening of the new canal that the Ministry of Antiquities would start a major project to contextualise Egypt’s military history. This is likely to focus upon the development of the Horus Road which still retains physical evidence of its ancient fortresses and military structures. However this will include the refurbishment of seven archaeological sites at Kantara East and West which will be opened to the public on a long-term basis. Development of the area may facilitate easier access to the CWGC cemeteries in the Suez area subject to the travel advice issued by the UK Foreign Office. In the early part of the First World War, Kantara was an important point in the defence of Suez against Turkish attacks and marked the starting point of the new railway east towards Sinai and Palestine, begun in January 1916. Kantara developed into a major base and hospital centre and the cemetery was begun in February 1916 for burials from the various hospitals, continuing in use until late 1920. 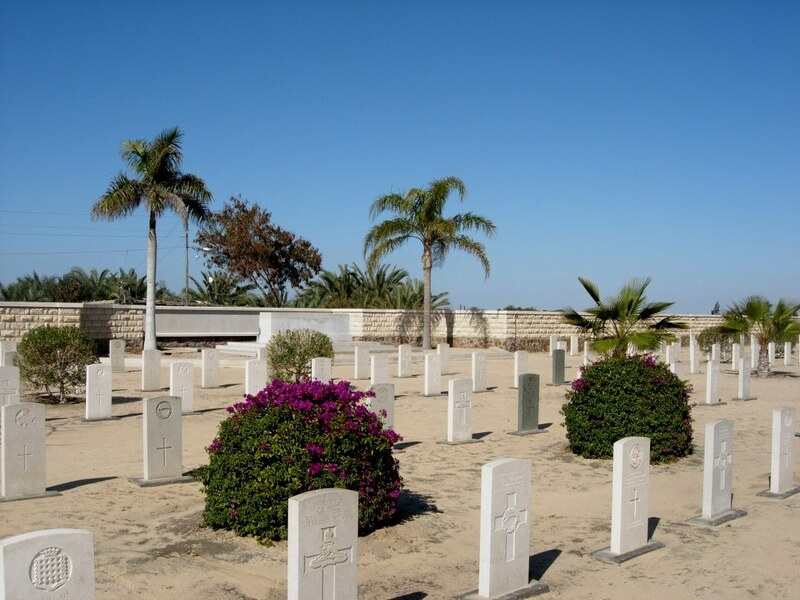 After the Armistice, the cemetery was more than doubled in size when graves were brought in from other cemeteries and desert battlefields, notably those at Rumani, Qatia, El Arish and Rafa. The Second World War again saw Kantara as a hospital centre. No 1 General Hospital was there from July 1941 to December 1945 and two others, Nos 41 and 92, were there in turn for varying periods. One of the major allied medical units in the area, No 8 Polish General Hospital, adjoined the war cemetery. The Cemetery contains 1,562 Commonwealth burials of the First World War and 110 from the Second World War. There are also 341 war graves of other nationalities in the cemetery, many of them made from the Polish hospital and concentrated in a distinct Polish extension.